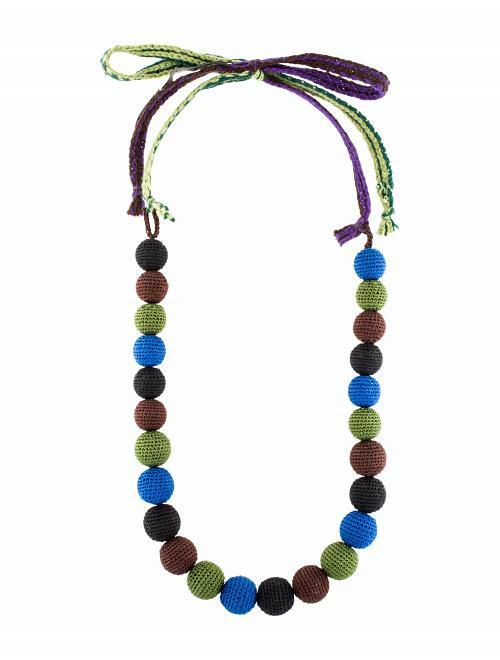 Prada's multicoloured ball necklace will add texture to a plain top or dress. The 24 knitted baubles in black, brown, green and blue are complemented by green and purple ties. Sophisticated and trendsetting, Prada’s inspiring concept of uncompromised quality and constant innovation has endured from 1913, when Mario Prada, Miuccia Prada’s grandfather, opened a shop of luxury goods in the Galleria Vittorio Emanuele in Milan. The search for rare and valuable materials and sophisticated manufacturing techniques is part of Prada’s DNA.